At mango optical, we offer a free contact lens trial where we invite you in to meet our optician and go through a fitting process. During this time we will check what lenses are best for you, teach you how to put them in and take them out as well as the all-important care of your lenses. The price of your lenses includes cleaning solution and annual aftercare. There are three options of contact lenses at mango optical which are daily, monthly and continuous wear. 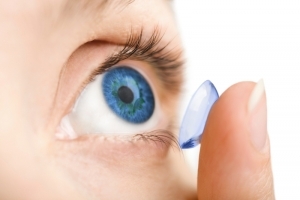 Daily contact lenses are a great option for occasional wear and/or allergy sufferers. There is no cleaning involved with daily lenses as they are binned after every use so no hassle with solution. They are a great healthy option for your eyes as there is no build up on the lens as they are single-use so it’s a new lens in your eye each day. We supply a large range of daily lenses from Coopervision, Alcon, Bausch & Lomb and Johnson & Johnson. Great for allergy sufferers as a new lens daily in gentler on the eye and no buildup of pollen. Monthly contact lenses are designed to be worn for up to 30 days and removed, cleaned and stored in contact lens solution each night. They are a great cost-effective alternative to glasses and are easy to clean with a multipurpose solution. There are many options for monthly lenses, coming in many materials and a wide range of powers, with the newest options offering more comfort with higher water content. Toric contact lenses are designed to correct prescriptions with astigmatism that a standard contact lens cannot correct. Both dailies and monthly lenses come in toric form and are specifically designed to fit the shape of an astigmatic eye. If you have an astigmatism, you have been probably told your eyes are ͚more rugby ball shaped than round͛. These specially designed soft contact lenses come in a variety of powers. They have developed massively over that last couple of years so if you have been told in the past you were not suitable due to your astigmatism, there may now be an option for you.